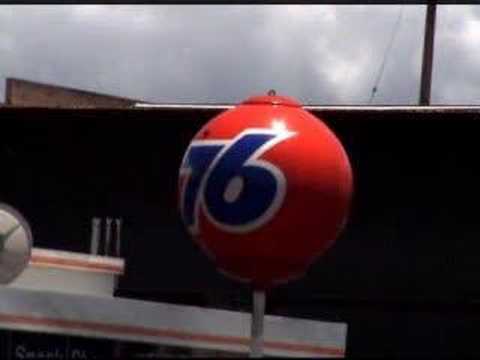 Since the launch of this campaign, Earl Ma has been one of the 76 Ball’s most passionate supporters, but he has outdone himself with his latest effort: a series of short films celebrating spinning 76 Balls on display in their natural habitats. Part one: Hawai’i! Earl’s films were all shot in Spring 2006, and more will be posted soon. Anyone with a favorite local 76 Ball and access to DV-quality equipment, please make your own film and we’ll be happy to share it on this site. I asked Earl about his intent with creating these shorts, and he replied, "This is the least we can do in terms of ‘preserving’ them, in full color/motion, for future generations, because there is no telling how long these specific examples will last." He is interested in "illustrating in an animated manner why these signs matter–because of how they fit into the cityscape at large. And they’re not supposed to be static (of course it doesn’t help when they’re not turned on)." His main reason for getting out in the streets with his camera? "Nobody else has taken the initiative to do this!" 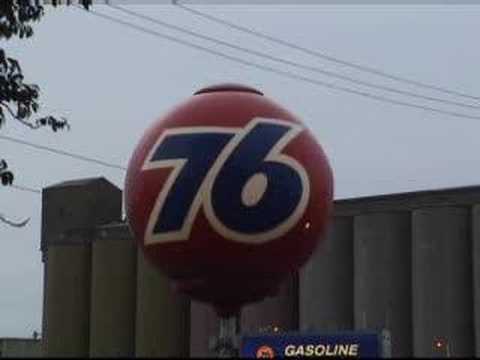 Hooray for Earl Ma and for the 76 Ball!